It’s been a full 48 hours since George Lucas — by way of shoveling Lucasfilm to Disney for $4.05 billion — announced plans for a new Star Wars trilogy that he personally will have very little to do with. So what do we know so far? Stunner! 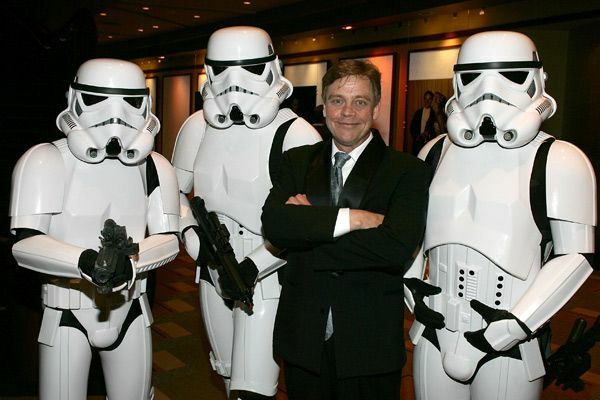 Mark Hamill wasn’t in the loop. Speaking to EW, Young Skywalker explained that Lucas had previously filled him in on plans to break out Episodes VII, VIII, and IX, but that he was kept in the dark on the actual sale: “Oh my gosh, what a shock that was! I had no idea that George was going to sell to Disney until I read it online like everybody else.” Also: “He seems to be in a really good place. He’s really happy. And that’s nice because I know that when we were making the movies, he was not a jolly guy on set. [Laughs] I always felt badly for him because he agonizes over details, and I’m sure after imagining it in his head for so many years, to see it realized — he’d look up and just hang his head and groan. Harrison [Ford], Carrie [Fisher], and I were always trying to cheer him up and joke him out of his doom and gloom.” By the way, Hamill is a gainfully employed voice actor these days. So no jokes about him standing outside the gates of Skywalker Ranch begging lowly Lucas underlings for a conversation about the possibility of a walk-on cameo! OK, and now on to the movies themselves. The L.A. Times reports: “In the months before Disney announced it would acquire … Lucasfilm, several different screenwriters paid visits to Lucasfilm’s Northern California compound to pitch George Lucas and his co-chair Kathleen Kennedy their ideas for the new live-action installment … the screenwriters were pitching ideas for a new story, not ones adapted from existing ‘Star Wars’ books. [The Times‘ source] did not reveal the identities of the people who had met with Lucas and Kennedy but said they were well-known screenwriters with experience creating big-budget Hollywood films.” Also: “Chief Financial Officer Jay Rasulo told analysts there was already a ‘treatment’ for the movies but did not specify whether that came from Lucas or an outside writer.” Oh, and while we’re on the topic of who’ll actually get hired to write and direct these things — is it possible to, like, conscript top talent into it? Do we have any legal wherewithal to force David Fincher to direct Episode VII? popping out a pair of twins (of course) among other things. As for the name Thrawn, well, that refers to a grand admiral with imperial sympathies who takes over as the leader of the vanquished enemy faction.” But, again, they will have nothing to do with the new live-action movies. So, who really cares. Oh, and Big Boi dressed as Darth Vader for Halloween, so he should definitely be involved in this new trilogy.